I’ve heard this countless times from cat owners. And I will admit that sometimes I just might be out of my mind. Despite the state of my mental health, most cats do need grooming from time to time. If you are the proud owner of a long-haired feline you know this all to well. Those of us who claim ownership to such a breed have come to understand that black outfits are no longer allowed unless we are into the white-cathair-all-over-black-pants look. Last time I checked it wasn’t the fashion. wner. And if having your obsessively clean mother-in-law find a hairball on the kitchen floor isn’t bad enough, the sound of your cat barfing one up is. Beyond the shedding and subsequent hairballs, cat owners often find themselves battling tangles, mats, eye stains, and more. This is where the professional cat groomer comes in. The cat groomer, you see, is the brave soul who fearlessly takes on the deadly challenge of immersing an animal into a tub full of what it hates most. Cat vs. Water. Big strong cat with sharp teeth and eighteen VERY sharp claws vs. tub of water AND cat groomer. You get the picture! Yes, I am a groomer of cats. I have battle scars to prove it. And I love my job immensely! Cats get greasy. It’s a fact. You may not realize it because you are used to the way “Fluffy” looks and feels. But, trust me, cats get VERY greasy, as though they’ve been rubbed down with a stick of butter. Imagine if you didn’t wash your hair for a few years. Natural oils build up over time. 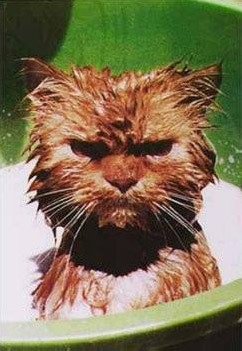 Combined with the oils from our hands that are left behind when we pet our feline buddy, grease eventually takes over. Natural shedding takes place throughout the year, most often in the spring and summer when the temperature warms up and the days get longer. As the hair sheds, the greasiness of it causes it to stick together in a clump. This clump of hair is small at first but grows about as fast as kudzu. Before you know it, “Fluffy” is no longer fluffy. Instead, “Fluffy” looks like he’s wearing a toupee of matted hair. At this point “Fluffy” must be shaved to remove his new “do” thus provoking what I like to call the “Samson Syndrome.” This is where your usually stealthy and outgoing cat now slinks around the house with his belly to the ground as though weak and totally embarrassed by his new nakedness. With time he gets used to his new look. And with time, his hair grows back in, and his strength and personality return. “Fluffy” is fluffy once again. The cat groomer’s job is to wash that grease right out of the hair. Keeping the grease away with a good bath, blow dry, and comb-out will do wonders for any feline. It is a known fact that after a thorough grooming session the amount of shedding and hairballs is significantly lessened. This in turn makes you fall in love with your little furrball all over again now that life and the living room carpet are a lot cleaner. “Fluffy” is still fluffy and looking mighty fine. Besides coat care, a good cat groomer will also take the time to thoroughly clean the cat’s ears and clip all nails so they are no longer vicious weapons used on you just when you least expect it. A cat groomer also keeps a sharp eye out for signs of fleas, ear mites, and an assortment of other feline-related inconveniences. Catching these conditions early on can help prevent more serious problems and the huge vet bills that accompany them. If you share a home with a longer-haired breed, you may want to take advantage of such options as a belly shave, sanitary clip, or lion cut. All of these will help tremendously in making life cleaner, neater, and more manageable for you and your feline bed-buddy. And a good cat groomer will be happy to share with you some tips on what you can do at home in between grooming sessions to help keep your kitty in the best condition possible. We have all of the right tools, products, and learned techniques – which makes all the difference in the world to your cat. And having a happy, well-groomed cat can make all the difference for you.